The first of eight new Type 26 frigates being built for the Royal Navy has been named HMS Glasgow. 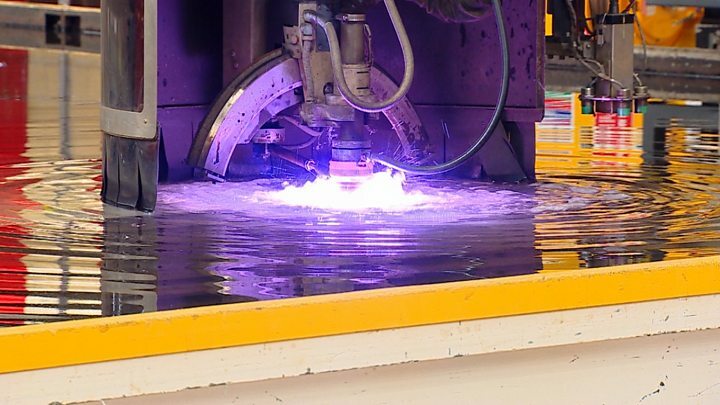 The name was revealed by Defence Secretary Sir Michael Fallon as he cut the first steel on the ship at BAE System's Govan shipyard. The new anti-submarine warfare frigates will be known as the City Class. Earlier this month the Ministry of Defence announced a £3.7bn order for the first three Type 26s, which are due to enter service from the mid-2020s. The contract for the second batch of five ships is expected to be negotiated "in the early 2020s". The MoD said the work would "support and sustain" 3,400 jobs - half at BAE's Govan and Scotstoun shipyards - with the rest in the supply chain. Sir Michael told BAE's workforce at the steel-cutting ceremony: "Today marks a historic milestone for the Royal Navy, Scottish shipbuilding and UK defence more widely. "HMS Glasgow and the other seven frigates in this new class will protect our powerful new aircraft carriers and nuclear deterrent, helping keep Britain safe across the world. "The Type 26 is a cutting-edge warship that will maintain our naval power with a truly global reach. "Designed for a service life of at least 25 years, the Type 26 frigates will form a backbone of the future Royal Navy surface fleet well into the future." There have been eight Royal Navy ships bearing the name Glasgow since the early 1700s. In more recent history, two ships served during the world wars, including the Arctic convoys and the Normandy landings. The last HMS Glasgow - a Type 42 Destroyer - was awarded the "Falkland Islands 1982" battle honour. During the Falklands War, the ship was damaged when a bomb struck it but failed to detonate. Glasgow was decommissioned in 2005. Admiral Sir Philip Jones, First Sea Lord and Chief of the Naval Staff, said: "The Clyde was the birthplace of some of the greatest fighting ships the world has ever known, and so cutting steel there today for the future HMS Glasgow is symbolic of a Royal Navy on the rise once again. "The name Glasgow brings with it a string of battle honours, stretching from the Arctic Circle to the South Atlantic. "As one of the world's most capable anti-submarine frigates, the Type 26 will carry the Royal Navy's tradition of victory far into the future." An initial development deal to build Type 26 combat ships in Glasgow was signed in February 2015. Construction of the ships was initially expected to start in 2016, but Sir Michael said in June last year that no deal to build the frigates would be signed until it offered "value for money". The Type 26 frigate is principally designed for anti-submarine warfare and will partially replace the current Type 23 frigate. Each ship will carry a crew of 118, have a top speed of more than 26 knots and a range of 7,000 nautical miles.